Hello Dealsnloot Readers,Xiaomi Redmi 3S Prime and Xiaomi Redmi 3S have been launched at a price of Rs.8,999 and Rs 6,999 each in India. 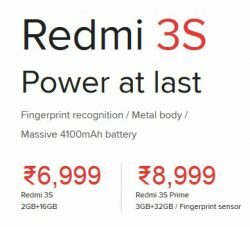 Xiaomi Redmi 3S comes with 2GB RAM and 16GB storage, while the Redmi 3S Prime has 3GB RAM and 32GB storage.After Huge Success Of Redmi Note 3, Mi Launched A New Awesome Smartphone Series Redmi 3S Prime, Registration Is Open For First Sale On 7th September 2016 At 12 Noon. Script to Buy Redmi 3S Prime on Flipkart will be add on 7th September 2016.So Grab This Loot Sale. Redmi 3S Prime on 7th September, 12 Noon !! First Sale of Redmi 3S on 7th September, 12 Noon !! Auto Buy Script for Redmi 3S: No Need of Script, Open sale. 2. After That , right click anywhere on the blank part of the page. 4. See At bottom a And image below than click on console tab. 6. congo !! Phone will be added to a card .Make payment or Do cash on delivery. The next step in the Redmi evolution, Redmi 3S is dressed in a premium metal body. That’s not all, it houses a powerful Qualcomm® SnapdragonTM 430 processor, massive 4100mAh battery, 13MP Phase Detection Autofocus (PDAF) camera and 12.6cm (5) HD display. Despite these upgrades, it is surprisingly 0.9mm thinner than Redmi 2 and sits comfortably in your hand. The combination of these in Redmi 3S are just the tools you need to connect, explore and take on the rest of the world. Redmi 3S unlocks at the slightest touch. Lightly tap your finger on the sensor and it responds in an instant. It’s faster and more convenient than pass-codes and pattern unlocks. You can also add layers of security with smart features like App lock, Hidden folders and Hidden notes. Redmi 3S has a 12.6cm (5) fully laminated display packed with pixels for HD resolution. It also has Reading mode, which prevents eye fatigue by reducing blue light rays from the screen. Color temperature can also be adjusted based on your preference – warm, standard, or cool. Stay focused with Phase Detection Autofocus (PDAF). Previously only found in professional DSLRs, it is a focusing technique that calculates a one-time lens adjustment for clear, crisp images in a fraction of a second. Redmi 3S lets you take full advantage of PDAF on its 13MP full-feature camera, which comes with built-in HDR and 12 playful filters.